Pokemon Duel has received a new update. The latest content addition features the Bug Gym Cup, available until July 26. The latest cup features all Bug-type Movement 1 and 2 figures that receive an increase of 1 for movement. Fire-types get an Attack increase of 20 for each attack. At the end of the event, players can receive trophies that will be displayed on the ranking screen. 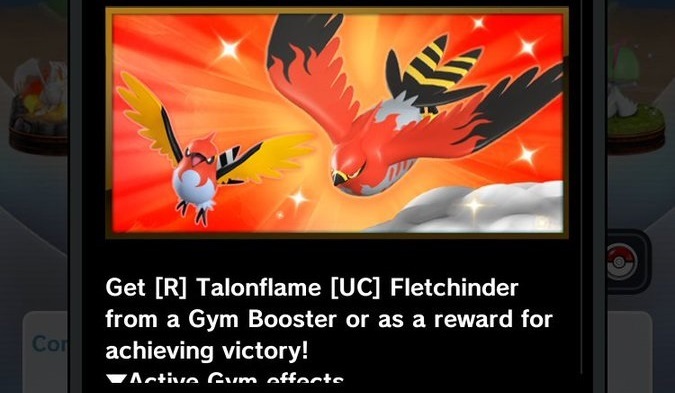 Fletchinder and Talonflame Figures are also being handed out as prizes. 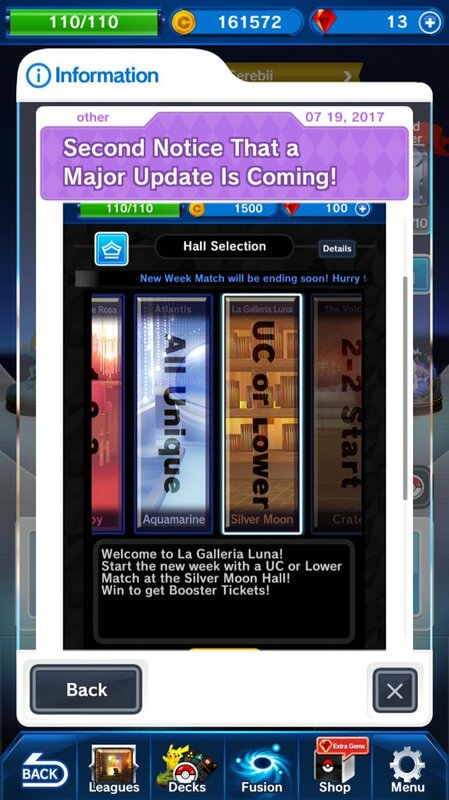 The first hint for the next update coming to Pokémon Duel has just been revealed. The screenshot above shows a list of Halls you can select from the Single Player mode. It seems you will be able to pick a special mission like using all Unique figures or only figures that are UC or lower on specific stages. There will be more information about the update coming out on July 26th. Pokemon Duel’s latest update is now live. Players should be able to download Version 3.0.12 from both Android & iOS. The update includes balancing changes to some of the figures in the game which you can check out the changes here. 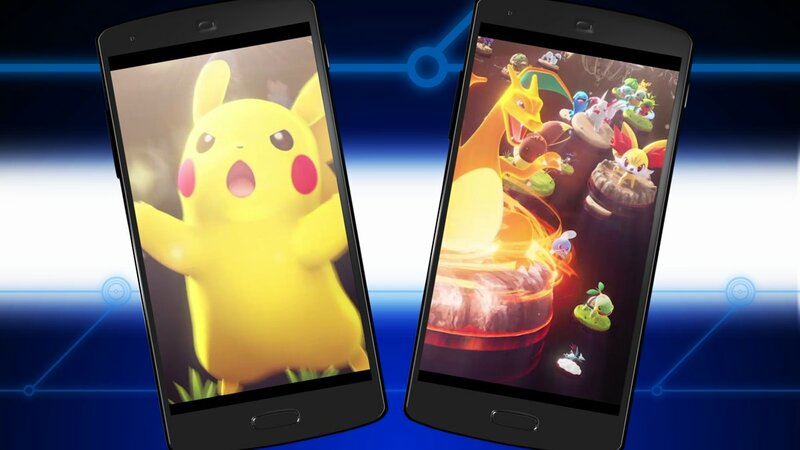 A big update is on the way to Pokemon Duel. It’s unclear what’s planned, but more information is due to be released on July 19. 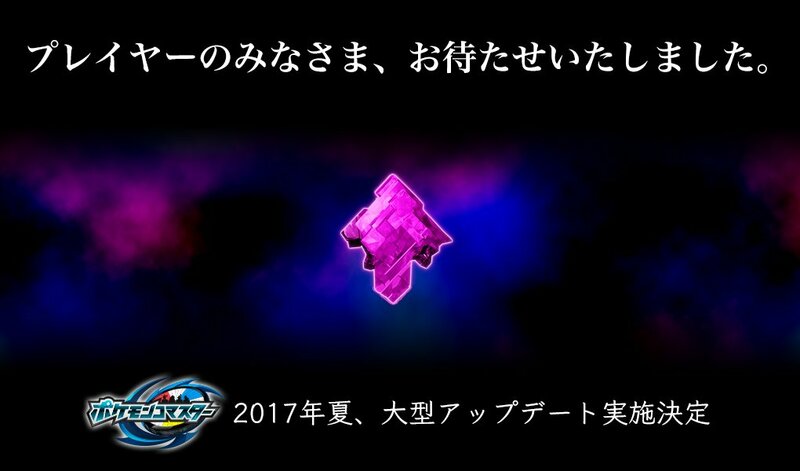 For now, we only have an image that features a large purple crystal. Expect additional news soon. 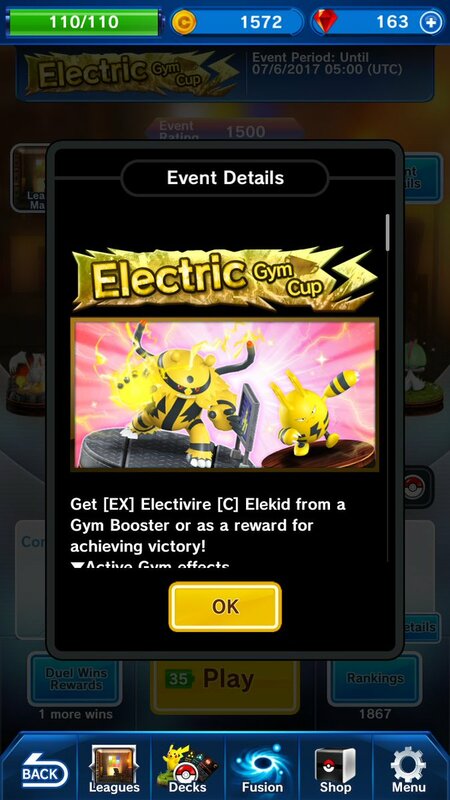 The Electric Gym Cup event is now live in Pokemon Duel. Until July 6th, 4:59 UTC, all Electric-type Movement 1 and 2 figures get an additional 1 movement. Furthermore, all Ground types get a boost of 20 to all of their attacks. Gym Boosters can contain the [EX] Electivire and [C] Elekid figures. 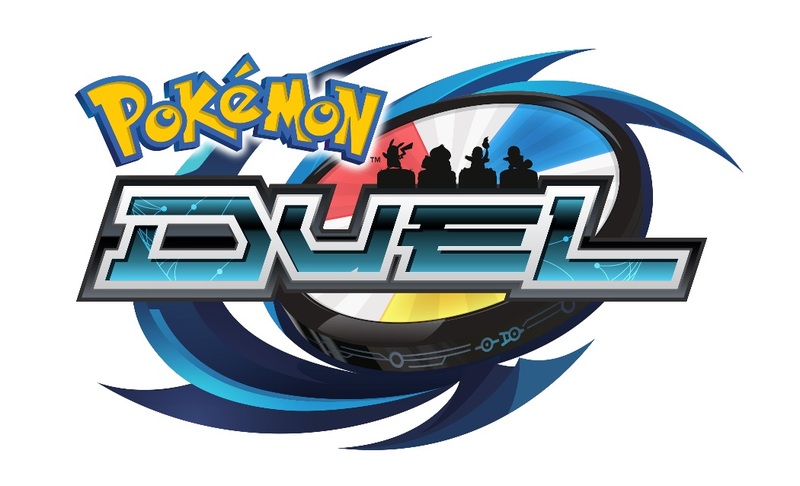 The newest update to Pokemon Duel is now available. The update includes balancing changes to some of the figures which you can check out the changes here. Decreased the miss wheel size for Bite. 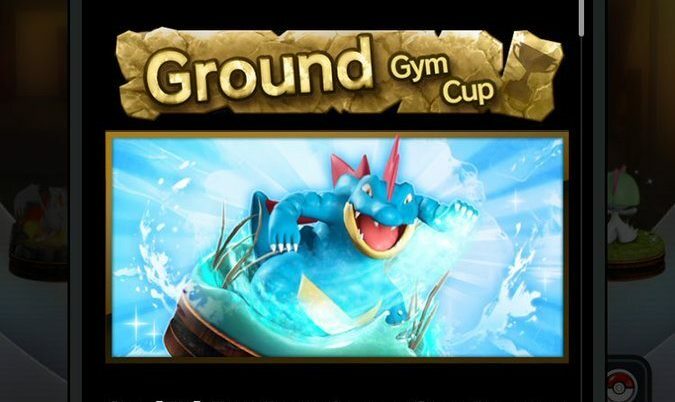 Pokemon Duel has been updated with the Ground Gym Cup. All Ground-type Movement 1 and 2 figures get an increase of 1 for movement and Water-types getting an Attack increase of 20 for each attack. 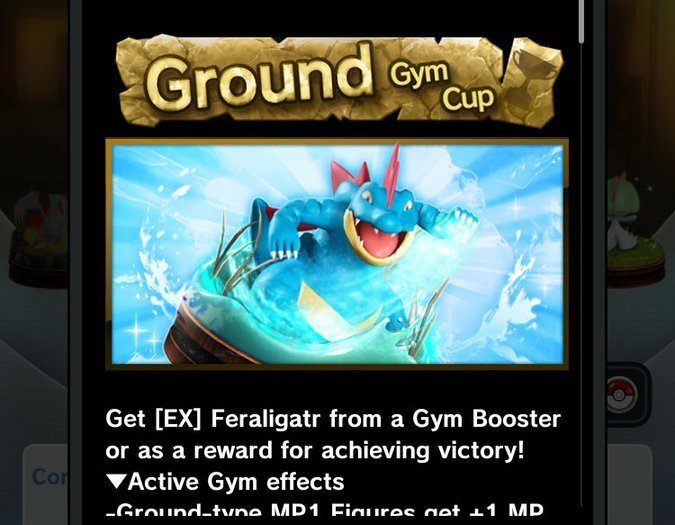 The Ferligatr Figure is being handed out as a prize for completing the cup. When the event finishes, trophies will be available that can be displayed on your ranking screen. The cup lasts until June 21.